Yes, I couldn't image having to be in the same home for longer than 4 years...I would go crazy. That is one reason we are just starting construction on our 4th home in 7 years...and we are already looking for the next lot for house #5. Oooo I love the yellow chair. What a nice pop of color! That bedroom is unreal. Yeah - I agree. I feel like I am alwaaaays doing something with my home. love this bit of inspiration. had to snag it for my files so thank you! This room is so pretty! I love that pop of yellow! Happy Monday! An ex boyfriend was constantly exasperated with my evolving projects. He said it was me "never being happy with anything." He obviously didn't understand my mindset or creative process. We've parted ways (over stuff much bigger than rearranging bookcases) and I've enjoyed the evolution of my own space ever since. What I'm saying is embrace the shift and drift of your creative whims. It's what makes us great and makes things happen! i love the bench in front of the bed - and no - i change my "style mind" all the time! Love the room but I love your master suite as well! I wanted to ask where you got your dresser from? I am in need of a new dresser and I love yours! You are the last person who needs to work on their bedroom... um, yours is perfection! 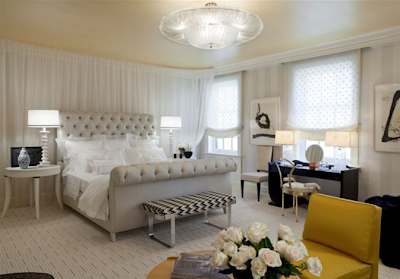 Absolutely love the bedroom - the tufted bed is fabulous!! I am constantly changing my bedroom around....actually I am constantly changing my whole house around. I think I am the most indecisive person when it comes to my own home. But I have to agree with Sarah "your bedroom is perfection".